Regulate how long a receiver has access. How can I limit my receivers access to my locker? Sharebox Admin has now 2 new features. Users can be regulated on how many times they can open a locker or you can set a date interval between a start and end date. You can now tell how many times you want a receiver to be able to open the locker before he/she looses access. 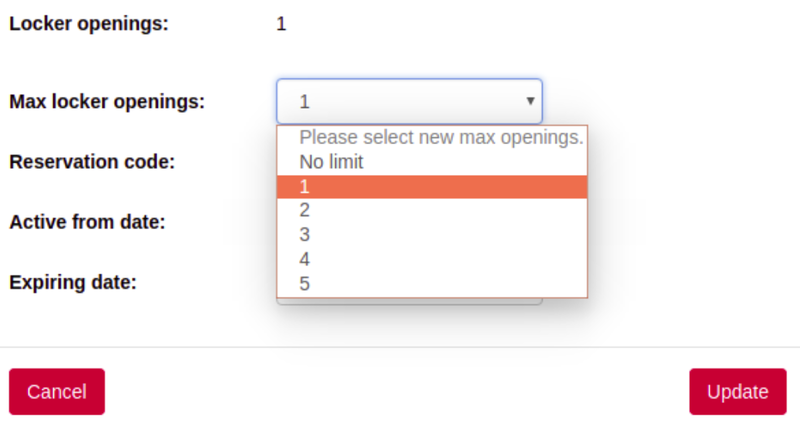 Current options are unlimited or max 1-5 openings. You do this by pressing the edit button on a receiver after adding him/her to the reservation. The receiver will be removed 30 min after he has reached his opening limit. You can also limit a receivers access to the locker between two dates. A start date and end date. You also do this by pressing the edit button on a receiver after adding him/her to the reservation and pressing update.